A hundred years of Russo-Finnish history were recognised at a special ceremony in Helsinki, as Russia’s President Dmitry Medvedev laid a wreath at the tomb of Finland's most celebrated soldier, Carl Gustav Mannerheim. Another Finnish leader commemorated by Medvedev was the eighth President of Finland, Urho Kekkonen, who realised a new political course in relations with Russia. 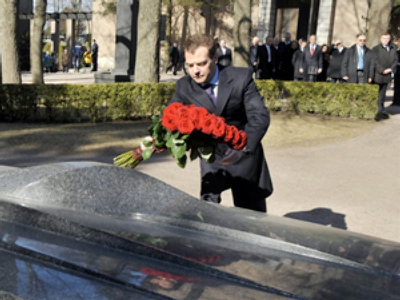 According to presidential aide Sergey Prikhodko, quoted by Itar-Tass, Medvedev’s visit to Mannerheim’s and Kekkonen’s tombs shows a broader view of Russo-Finnish history being adopted by official Moscow. The first day of Medvedev’s visit in Finland, was devoted to talks with his current Finnish counterpart Tarja Halonen on energy cooperation, strengthening business ties, and other pressing issues. After that, Medvedev and Halonen visited the city of Porvoo, situated some 50 kilometres from Helsinki, and 130 kilometres from the Russian border. It had been there that the Finnish Sejm took an oath of loyalty to Russian Emperor Alexander I in March, 1809. The Russian president toured the city, visiting its town hall and a cafeteria. The Russian president also shook hands with the local residents and school children. Talking to the media, Medvedev said he was pleased to be at Porvoo, which he described as a “symbolic place for Russian-Finnish relations." Carl Gustav Mannerheim was an immensely successful military leader, who managed to avoid both diseases of 20th century Europe – communism and fascism – a factor that at some point might well have saved the sovereignty of his country. Also, despite having been both a part of the Russian army, and an arch-enemy of the Soviet army, he was one of the few European leaders that never allowed Russophobe tendencies to blur his judgment, leaving the interests of Finland as his sole concern. Born in Finland – part of the Russian Empire – Mannerheim started his career in the Imperial Army. He also married a Russian, Anastasia Arapova, in 1892, who mothered two daughters. However, the marriage wasn’t a very happy one, and it dissolved in 1903. After participating in a series of Eastern expeditions – to the Middle East and China – he fought against Germany during the First World War. Overall, Mannerheim devoted 30 years of his life to the Imperial army. After the February Revolution of 1917 – a stepping stone to the October Revolution– he received a rank of Lieutenant General. But the new government quickly distanced Mannerheim from itself, due to his lack of support for communist ideals. However, he wasn’t left jobless for long. The Senate of the freshly independent Finland felt Mannerheim instrumental in the well-being of their country, and appointed him the Commander-in-Chief of the Finnish Army – a post he soon left, due to his aversion to the pro-German government of Finland. In the interwar years, Mannerheim held no public office, as most of the politicians were intimidated by the scale of his reputation and the lack of an appropriate alignment – pro-Russian or pro-German. However, as soon as the Winter War of 1939-1940 between the USSR and Finland became unavoidable, Mannerheim once more assumed command. Though Finnish forces were no match for the Soviets, his famous Mannerheim Line held Soviet troops for months. Despite being at war with the USSR, he gave a cold reception to Adolf Hitler on his visit to Finland in June, 1942. Mannerheim most notoriously lit up a cigarette in Hitler’s presence, despite the latter’s widely known extreme antagonism to smoking. Subsequently, as a Marshall of Finland, he was able to lead his country out of World War II as the sole country on the losing side that was not occupied by foreign troops. As soon as the war ended, Mannerheim retired to die quietly in 1951 at the age of 83.